Alev Karagulle at Burgess tells me of an highly unusual yacht for sale in the shape of the 55.8m Alucia, originally built as a submarine tender to carry French deep diving submersibles on historic missions around the globe. In 2007/2008 she was completely stripped, rebuilt, re-wired, re-equipped and re-tasked to deliver a wide range of capabilities. She carries two Deep Rover submersibles with two-person capability. There’s also state-of-the-art equipment for the production and storage of oxygen, nitrox, and helium for a wide variety of diving gas mixtures. Then there’s her large temperature controlled video editing suite designed specifically for use by National Geographic, Discovery Channel and other groups. Alucia also carries several deep ocean winches for deploying monitoring equipment and sampling and has an aquarium room – a light-tight space that’s fully climate controlled and designed for research and documentation purposes. Her interior is fitted out to superyacht quality and when in guest mode can accommodate 12 guests in two doubles and four twins. In commercial mode she can sleep up to 32 guests in bunks. 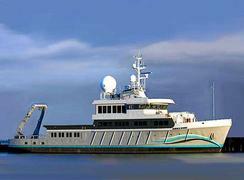 A joint central agency with Fraser Yachts, Alucia’s current asking price is $42 million.